Cache : 512KB write back direct mapped pipeline burstcache. 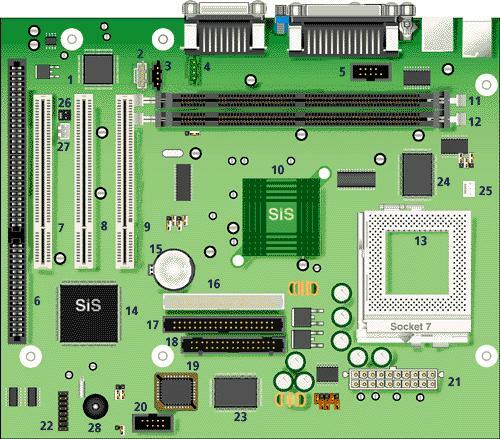 Chipset : SIS 530 & 5595 chipset. CPU Support : Socket 7 processors: Intel Pentium P55C, Cyrix MII, AMD K6-2. Expansion Slots : 2 PCI slots and 1 shared ISA/PCI slot. RAM : 2 DIMM sockets supporting single- or double-sided SDRAM up to a maximum of 512 MB. Video : Integrated in chipset. CPU : CPU upgradable up to 450 MHz. RAM upgradable up to 512 MB using 66 or 100 MHz SDRAM DIMMs. The Miami motherboard only accepts 168-pin DIMM modules. Only gold-plated DIMMs may be used, as the sockets on the motherboard are also gold-plated, and oxidation must be prevented. Use 60 ns, 3.3 V CAS Latency 2, single- or double-sided DIMMs only. Parity is not supported.